The Coopered Tot: Reuven Weinstein's Warm House... And The Killer Blind. Reuven Weinstein's Warm House... And The Killer Blind. Hanging out on the Internet Bourbon forums you meet and befriend a lot of interesting people. I love meeting these people in real life. I've met Reuven Weinstein - a master dusty hunter out of New York - a number of times, but recently I had the great pleasure of spending the whole afternoon with him and his lovely wife Ilana (who was his public face of Facebook for a long time) at his home in Rockaway Park / Belle Harbor. Ostensibly a house warming - the house has a real story of destruction and rebuilding. The Weinsteins just recently moved into it. 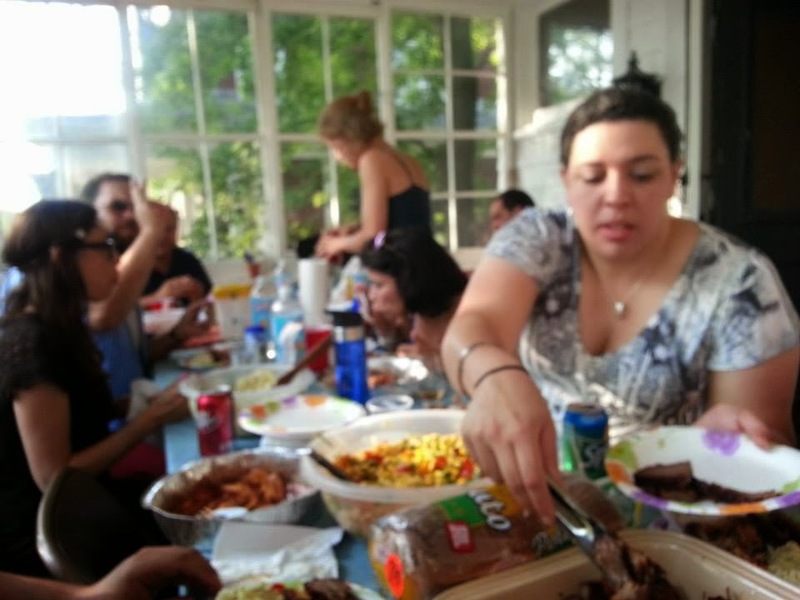 There was a ton of delicious home made salads, hot wings, and world class smoked BBQ brisket. Just delicious. And there was also whiskey - lots of it. The very best stuff. Because Reuven is a master whiskey hunter. The pictures and tasting notes below speak for themselves - but they aren't the reason for the post. Not at all - but that will come later. 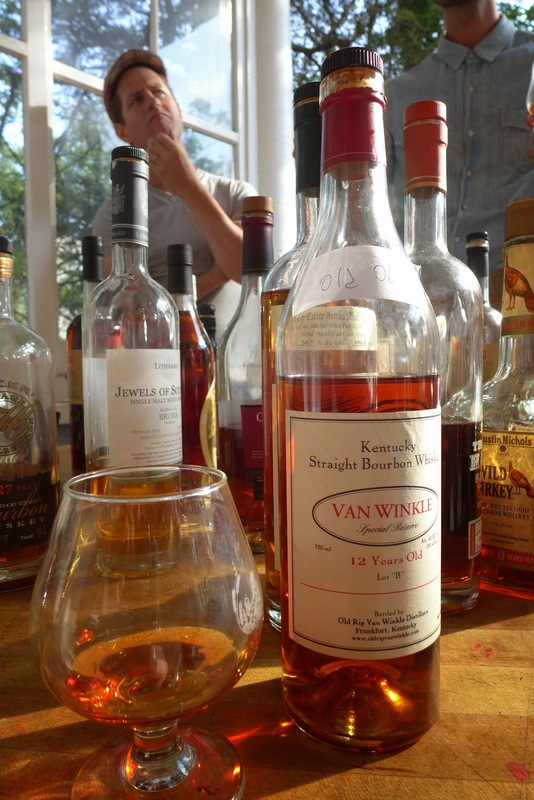 Reuven is well known in the American whiskey world. 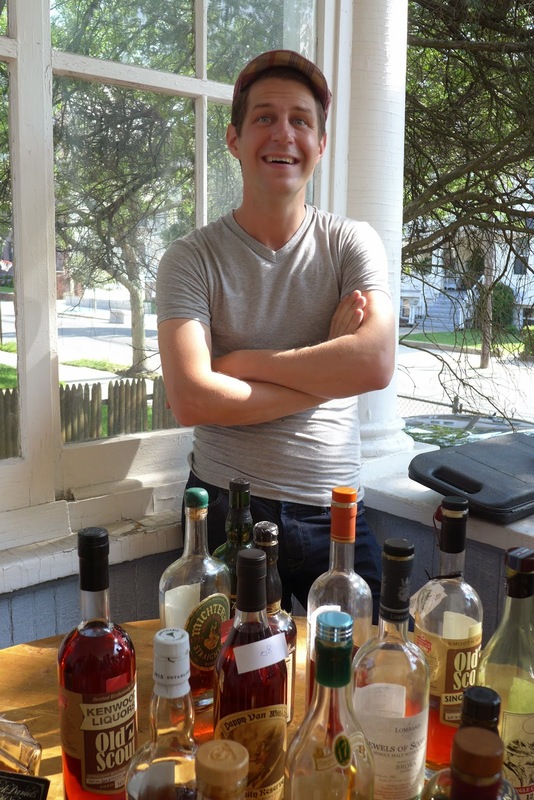 He is a prodigy - a talent at entering neighborhoods that others wouldn't bother with and somehow coming out with a trunk full of absolute treasures from the liquor stores there. As Reuven toured us through a small portion of the fabulous whiskies he has collected I was amazed time and again by both the fabulous range - from dusty bourbons and the rarest issues to fabulous single malt - with a focus on spectacular and hard to find silent distilleries - and also by our hosts tremendous generosity. What we tasted that day is not to be forgotten. And it was but a peek into his fantastic collection. Which only underscores a curious and oft remarked on fact: Reuven doesn't drink whiskey. Nope. He enjoys nosing it. He produced a 1984 vintage single cask Yamazaki which he particularly enjoyed nosing. I must concur - it had the most remarkable nose: a complex and evolving aroma that started with dark cocoa with a hint of anthracite coal combustion (just a hint) and then moving into rich fig pudding baking in rum, and then on to a rich earthiness made farmy by a bit of animal skins. I could nose that thing all day too. But ultimately I want to take a sip. I suspect Reuven will too, someday soon. I can see the curiosity burning in him. Meanwhile, his personal code and clean habits keeps him holding back. After Reuven and Ilana served a killer spread of sweet smoky BBQ brisket and lovely home-made sauced hot wings, with homemade slaw, potato salad, green salad and all the fixings, I made the fatal error of pouring an award-winning Cotswald village Sloe Gin as an after dinner apertif. Wrong stuff for that crowd! 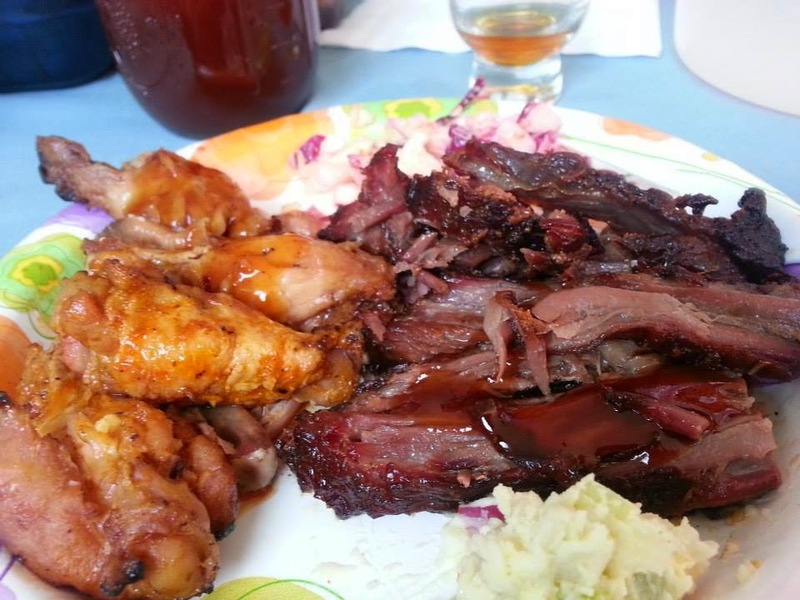 When I encountered the spread of whiskey on the table my eyes lit on two things right away. One The Parker Heritage 27 year old legendary PHC2 which I had never tried before. And right next to it was a 1980s vintage octagonal Wild Turkey 8 year old age statement 1.75 Liter handle. NOW WE'RE TALKING! Parker Heritage 2nd edition 27 year old is a legendary statement product from Heaven Hill. 2008 Malt Advocate Magazine's American Whiskey of the Year. I had tried and enjoyed a Wild Turkey 101 8 yo octagonal handle from the early 90s with Mike Jasinski a little while back. 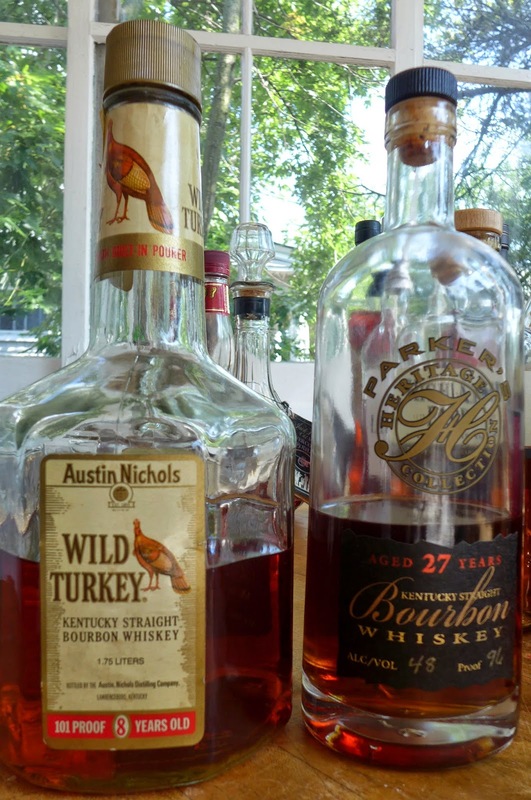 Lately I've been going deeper with Wild Turkey, and there's a strong argument for the 8 year old WT101 of the 70s-90s as being one my favorite primary expression (i.e. not barrel proof) bourbons. Nose: Rich rancio malt, sweet sherry nutty rancio, mead honey, deep iterated bourbon vanilla pods: sweetness. Then tempered by buttery notes and oak incense. Palate: Sweet honey malt opening. Waxing into acetone-citrus with ripe cantaloupe, salted caramel with tannin spiciness on the finish. Light texture on the mouth feel but big spicy finish. This stuff is a lot like really old cognac with its darkly vinously sugared and oake loaded luxury. Among the darkest, richest, most indulgent Bourbons I've ever tasted. A really memorable pour (tasted both at the event and with a 1oz sample tasted at time of writing). This is excellent Bourbon that I've been tasting in a number of contexts. Here, it's a clear object lesson in the dangers of drinking something you really like immediately after an epic, world class whiskey. Let's just say, the right time to enjoy a WT101 8yo age statement dusty is NOT immediately after tasting PHC2 27 yo. Sweet and spicy as decently complex as WT101 was back in the day, it can't hold a candle to the glory cask selected wonder of that PCH2. It's an unfair juxtaposition. Sweet and comparatively gentle stuff. Nose: warm and malty with herbal wafts and a oak sandalwood essence undercurrent. Palate: malty juicyfruit opening with both magic marker and candy dish notes. The mid palate expands into brown sugar, herbal rye spice, warm honey, and sweet alfalfa turning into rye herbal spiciness and then a gentle oak tannin grip with a moderately long finish. Decent density in the mouth. A perennial favorite, but completely shown the door in that head to head. Distilled 1982, Bottled 2004, 22 years old. Palate: Intense honey, turkish delight (powdered sugar, fruity, nutty)., paraffin, heather florals, meadow grass. Not peaty or farmy. Lightly tannin spicy finish is the only hint of age. A heathery honey highland beauty. With the waxy floral notes this came off like a Clynelish. Light and beautiful - but oddly not complex considering it's age and method of manufacture. I could sip and enjoy this one all day. A true "session Scotch". 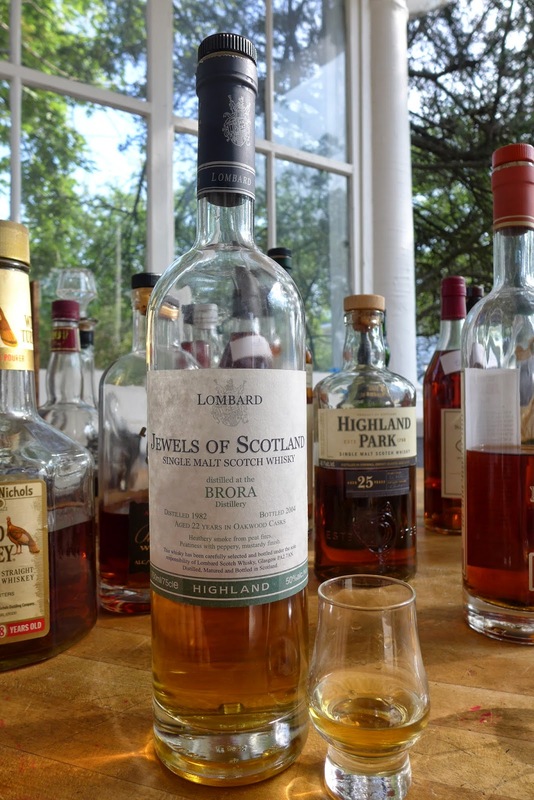 This bottling is all about the sunny, floral, honeyed beautiful side of Brora. Missing is the earthy farmy animal manure aspects, the peat, smoke, and darkness you often see with that distillery. I greatly enjoyed it. 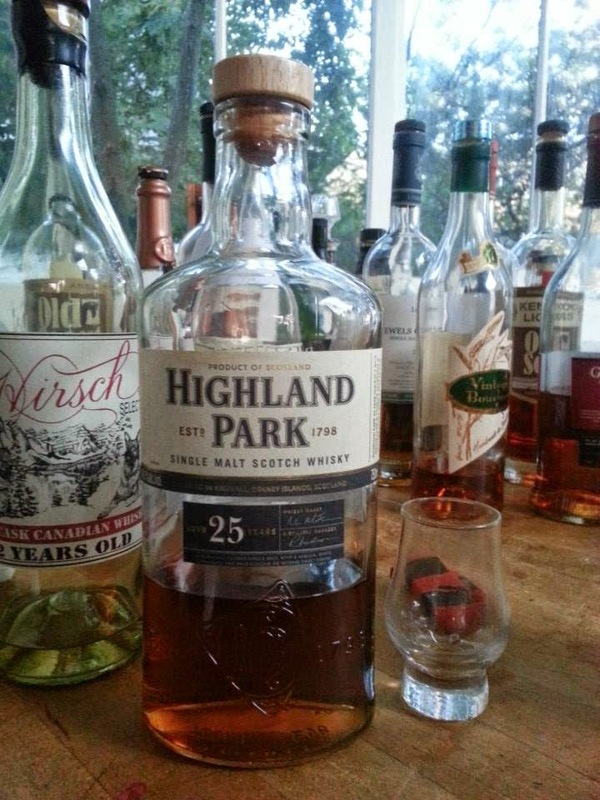 Highland Park 25 48.1% abv. Color: light medium amber with coppery glints. Nose: Heathery wild meadow florals open up for rich malty rancio riding on dusky animal farmy warmth and some underlying peat and sea coast. Fig cake and old sherry and leather notes play in the middle where the rancio lives. As it opens, safflower oil and then marigold yellow florals join the heather, sherry, coastal light peat aroma show. Palate: Sweet and rich on opening with black raisins, stewed black figs and malt sugars tempered by a whiff of brine. The expansion brings vinous dark sherry notes of purple fruits and leather and tobacco. It waxes into rich dark oak a satisfying warmth of gentle well integrated coastal peat and tails into a long, sweet, spicy finish with wood and smoke wrapped around the herbal tail of the malt and the lingering sweet of sherry rancio. 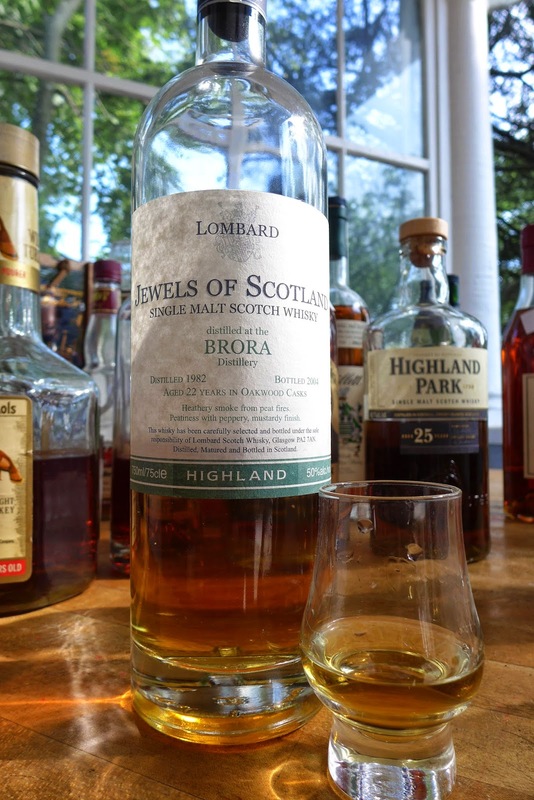 This is a full bore beauty of significant complexity and fills your mouth with a tour of the wide gamut of Scotch Whisky flavors - all of them. Floral, honeyed, sherried, peated, and coastal all combine to make this beautiful spirit. Like the 12 and the 18 - but with the darkness and intensity cranked up with maturity. What a beauty. Impressively, this stood up to the competition on the table with aplomb. The rear label only says Candian Whiskey * Single Cask * 12 years old * Lot 98-1 Bottled by Hirsch Distilleries Lawrenceburg, KY for Priess Imports, Ramona CA and bears a sticker in Japanese for sale in the Japanese market. 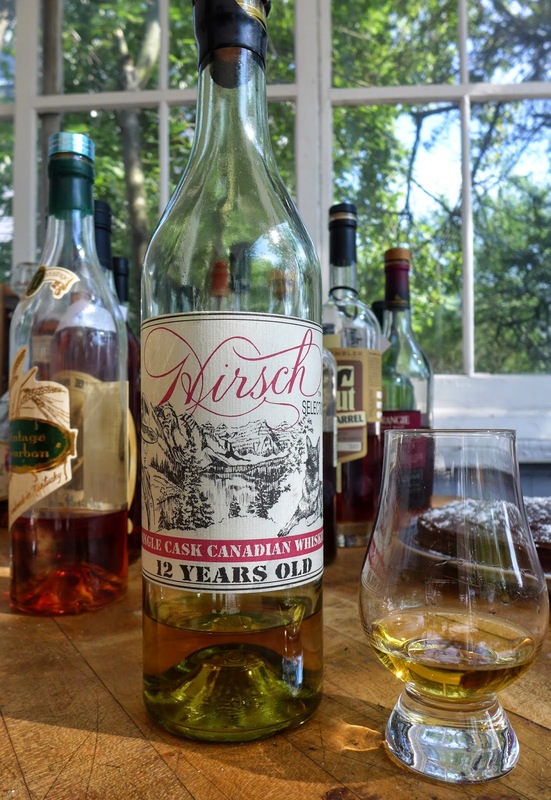 Rare and interesting as the odd-man-out bottling in the brief but now legendary association of Julian Van Winkle III's bottling operation with Priess Imports which had taken over the A.H. Hirsch lot of 1974 Bourbon from Michters and had started picking up odd lots and bottling those without the "A.H.". Steve Zeller toasts w PHC2. Anthony Colasacco, right. Nose: honey, herbal cedar with pencil shavings and mineral flint. Palate, sweet and lean and honey-floral on entry. Light and clean on the expansion where herbal spice, light clean mineral, and a bit of grapefruit fruit and also pith astringency take over. It tastes like a good Canadian blend of a corn base and rye flavoring whiskey. I wonder what it actually is and which of Canada's distilleries it came from. My guess would be Alberta distillery. It has some of those Alberta Premium whiskey flavors. Very refined for what it is. Nicely balanced. 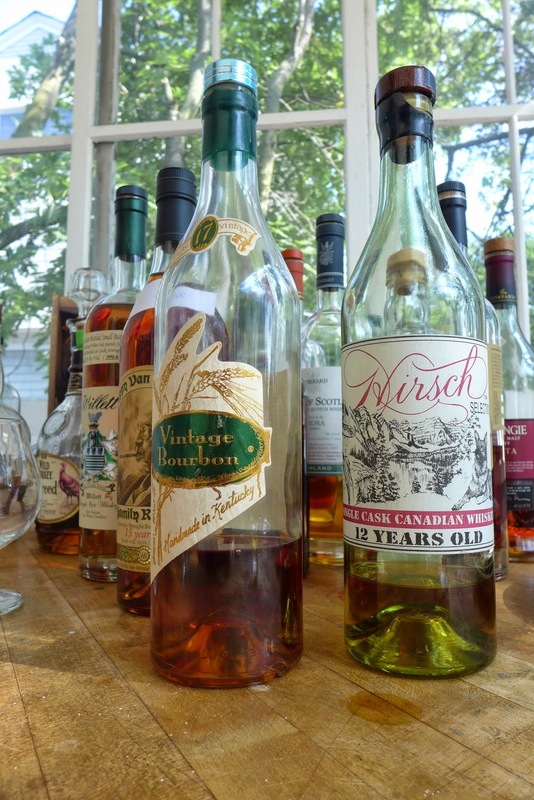 This somewhat legendary odd-ball bottling was a housewarming gift of Anthony Colosacco who is best known for his utterly fantastic whiskey bar in Mt, Kisco: Pour Mt. Kisco. It's the kind of bar where you can get a flight of Pappy Van Winkle Family Reserve - or all 3 Rittenhouse 21, 23, and 25. Pappy was well represented on the table with a bottle of Pappy Van Winkle Family Reserve 15 from 2006 and also a 2006 or prior (pre-laser stamped) bottle of Van Winkle 12 Lot B that Ari Susskind had been involved in locating. Great guys and a great whiskey. Soft and gentle Stitzel-Weller wheater flavors: mellow cherry root beer sandalwood incensed oaky loveliness. Palate. Intense (50+% abv) Honeyed, minted fig melon candy black plum with some apple skin waxes into big oak and spicy heat. Hint of clean highland peat or just big oak tannins. Maybe some active Spanish or French oak going on? Inchgower? Convalmore 36 - 1977 Diageo office 2013 realease 58% abv. Nose: Honey and floral heather with a hint of white white tartness, chalk mineral, and yellow grass in the Sun. 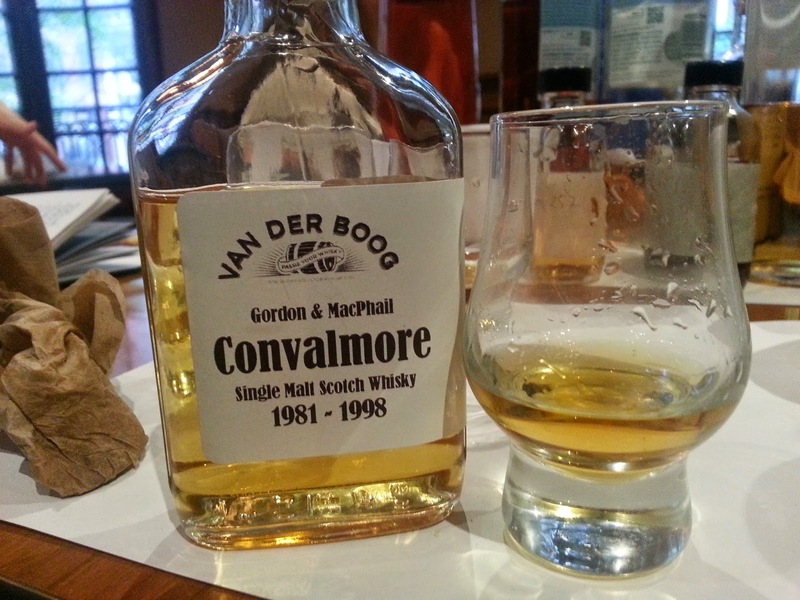 Palate: Sweet and gently honeyed on the opening with an immediate tart crisp apple skin quality. Floral and tart fruit on the expansion with a dry perfume aspect on top of a rich barley-malt chassis. The turn is all perfume and young sawn dried oak planks. Beautiful - and very much in the Inchgower/AnCnoc wheelhouse - yet totally unique. (Serge Valentin noted a touch of peat on the way to giving it a 76).
" I'd say it is most likely from the wood given that it's a mix of european and american oak aged for over 36 years. At that sort of age you can definitely get a certain amount of phenolic extraction from the wood which can come through as medicinal/spicy/smoky/menthol in varying degrees. 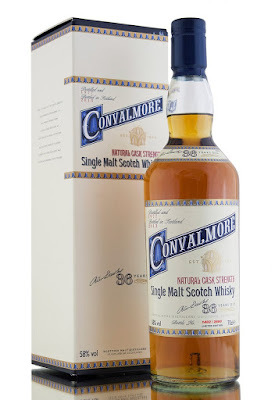 I doubt that Convalmore had any regular or meaningful peating level during the mid-late 70s. The ones I've tried from that time reveal it to have a spicy/herbaceous quality which I feel is very much part of the house style and derives more from the distillate. Anyway, I'm very much in agreement about the 36yo, it's an absolutely stonking dram!" Stonking dram indeed. I can't believe it was just handed out as a blind tasting as the post dessert apertif. That's class. Thanks, Reuven, for a wonderful time and a fabulous education! 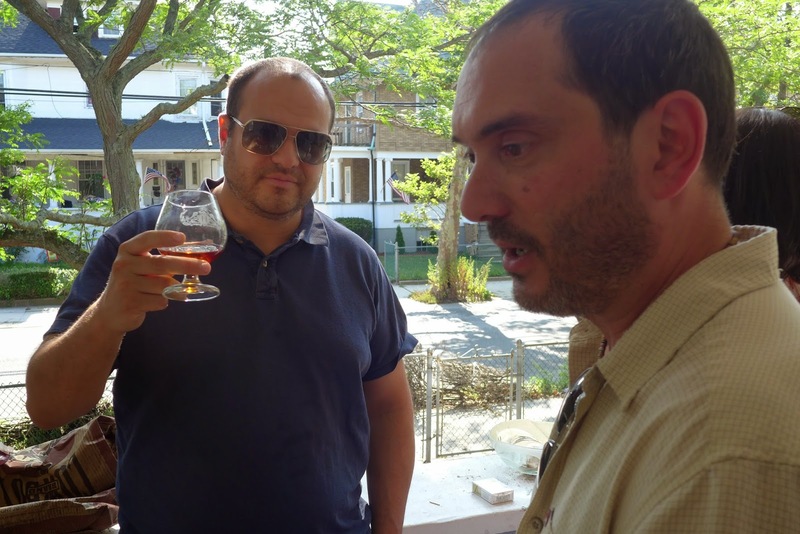 So... Reuven pours a PVW15 or ____ rare whiskey, noses, and dumps it out? Or, hands it over to a friend? I'm amazed that he'd be so driven to that much whiskey with nosing as the sole motivating factor. "Personal code and habits..." keep him from imbibing? Really - no more information there? How'd he get started? Has he ever tasted whiskey? If not, truly a perplexing 1st-world oddity, then, that someone would scour the earth for anything relating to it. His wife Ilana drinks it for him! There is more to the story, perhaps, But there are reasons to not discuss them (or any of the private activities of American whiskey enthusiasts) in print. 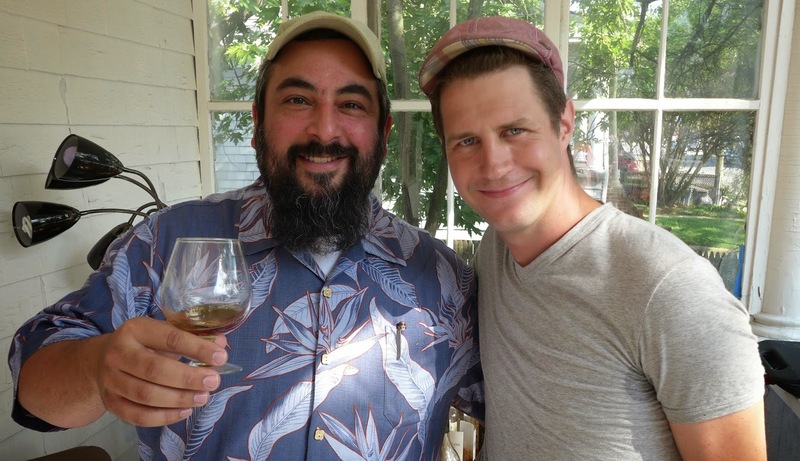 People get into the dusty whiskey scene for different reasons. That's the bottom line. I'm not about judging anyone for their motivations. I just want to see the whiskey respected and shared and end up with people who love it. Reuven clearly respects the whiskey - shares it and has his values in the right place. E-mail me if you want to discuss this aspect of whiskey culture further (privately). josh[at]cooperedtot.com.